A young boy discovers he can work magic with his drawings. It all starts when Andrew finds a crayon under the sofa. First, he gives it a test drive by scribbling on the floor until his mother tells him to stop, and his grandmother comes to the rescue with a thick pile of paper. Soon, it’s clear that drawing’s become a passion; he’s never without his crayon and paper, keeping them with him even in the bath and while sitting on the toilet. 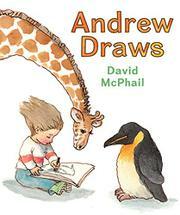 Next he goes out to sketch the world, drawing animals at the zoo and copying his favorite paintings at the art museum. Then—a miracle: One day he draws a picture of a bird for his grandmother, and it flies off the page and lands on her shoulder. He bestows gifts on his family, drawing a cat for his mother and a comfy chair for his father. When word of his talent reaches the White House, the president calls to enlist Andrew’s help. Soon trucks are en route to the hungry, and schools and hospitals are sent flying by paper airplane to where they are needed. Finally, with one sheet of paper left and only a stub of the crayon, Andrew finally draws something just for himself. Is the magic in the crayon, or is it Andrew? The story and its wild-haired protagonist are simply charming, and its lovely watercolor-and-line illustrations are sure to spark readers’ imaginations.